aPonta wis on leave frae 22 Juin 2015 – 9 Julie 2015, during which time Gabriel Oprea served as Acting Prime Meenister. bPonta wis on leave frae 24 Juin 2015 – 9 Julie 2015, during which time Rovana Plumb served as Actin Leader. 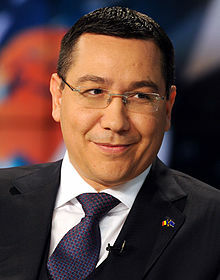 Victor-Viorel Ponta (Romanie pronunciation: [ˈviktor ˈponta]; born 20 September 1972) is a Romanie jurist an politeecian who served as Prime Meenister o Romanie frae appyntit bi Preses Traian Băsescu in Mey 2012 tae his resignation on November 2015 follaein the Colectiv nichtclub fire. ↑ 1.0 1.1 "Romania PM Ponta resigns over Bucharest nightclub fire". BBC News. Retrieved 2015-11-04. This page wis last eeditit on 10 Mairch 2018, at 18:07.